The mainstream media, the public and financiers are agog over the Zika virus (Zika) which is wreaking havoc on thousands of families and newborns in the vicinity of Piracicaba, Northeast Brazil. Zika cases have already been reported in Texas, Florida and Virginia. Opportunistic Zika is being presented by the mainstream media and some government agencies in the same manner as the beheading of an ISIL/Daesh prisoner, and with all the drama, color commentary and propaganda of the War on Terror, the War in Afghanistan, the War in Iraq, the War on Drugs, the War on Crime, the Cyber War, and the reemerging War against the twin Red—though capitalist—Menaces Russia and China. Is it possible for the United States of America to do anything other than wage war? At any rate, Piracicaba, Brazil, according to an Intrexon briefing at a JP Morgan sponsored conference, was the site of the “world’s first municipality to release Oxitec organisms [genetically modified organisms (GMO’s)] into the wild. 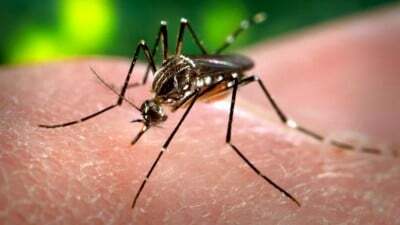 The organisms were genetically tricked-out male mosquitoes and the release of the flying critters took place in April of 2015. Oxitec is a subsidiary of Intrexon. The is no established link between Intrexon’s release of genetically modified mosquitoes and Zika or the birth defects attributed to Zika that are ravaging the families and children of northeast Brazil. But there is a link, however, between Intrexon’s timely purchase of Oxitec in August 2015 for $160 million, and the windfall that Intrexon expects to gain from its genetically modified killer mosquitoes. Already, Wall Street investors, business publications and media outlets are praising the use of GMO’s like those of Intrexon’s to wipe out malaria, dengue and other diseases even though there remains much scientific uncertainty over the long term effects of inserting GMO’s into the ecosystems into which human animals are embedded. “If the idea of introducing a turbo-boosted method of genetic modification into the wild sounds alarming, it should. In 2014, before it was even clear whether gene drives would work in insects, a group of US researchers recommended some safety guidelines and called for regulation and extreme caution before unleashing such a powerful technique in a natural ecosystem. The subsequent publication of a gene-drive system in flies led the same researchers (including those who did that work) to recommend lab containment procedures. If the name Greenberg Traurig sounds familiar, that because it was home to Jack Abramoff who brought in millions of dollars to GT while Alvarez was, ostensibly, in charge as GT’s CEO. According to GT’s website, “During his tenure as CEO, which began in 1997, he directed the firm’s growth from 325 lawyers in eight offices to approximately 1850 attorneys and government professionals…” GT has been involved in a number of unsavory activities over the years, many of them under Alvarez’s watch.